FK chats to Ellie & Sam, husband and wife team behind skateboard jewellery label, Deadwood Creative. Tell us a bit about Deadwood Creative and what we can expect to discover? Deadwood Creative is the design collaboration of husband and wife team, Sam Messina & Ellie Beck. We live and work in our home studio in the rainforest of northern NSW. 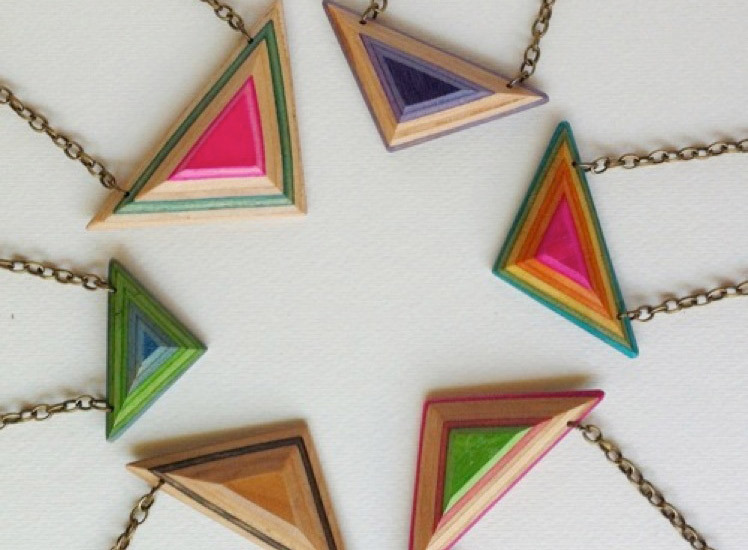 Deadwood Creative products are handcrafted from broken skateboard decks; we recycle each board into beautiful pieces of jewellery & accessories. 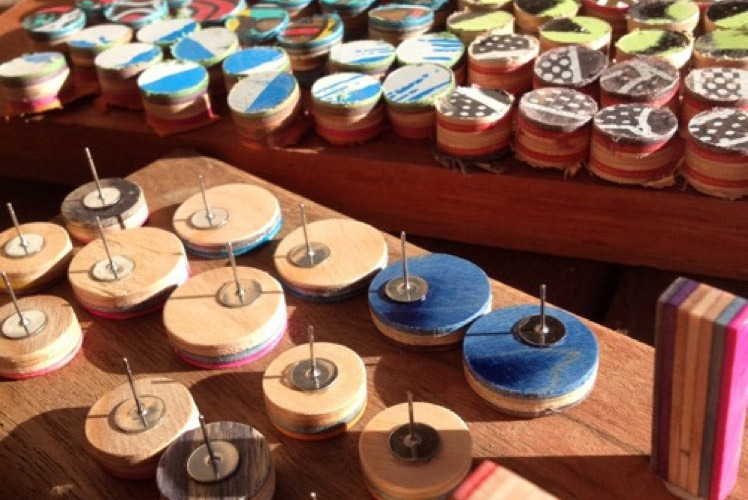 All our pieces are made by our own hands, and hand worked tools (no laser cutting or mass production). We try to use Australian made recycled materials in our products wherever possible, from our ear wires to our product packaging. This is a very important aspect for us, and is an extension of the way we live. Up until now we have been concentrating on our jewellery line and now we are looking at moving forward in to larger scale items, including small furniture and homewares. Both Ellie and myself come from extensive retail backgrounds; we’re both involved in many other aspects of art and design. I have been actively skateboarding for close to 30 years and worked in the skateboard industry for a good deal of my working life from the retail to the wholesale, production and design side of the industry. Ellie and I have been working together on projects pretty much since we met in 1998. Always with a strong design and environmental focus, committed to making pieces that bring meaning and purpose to someone. 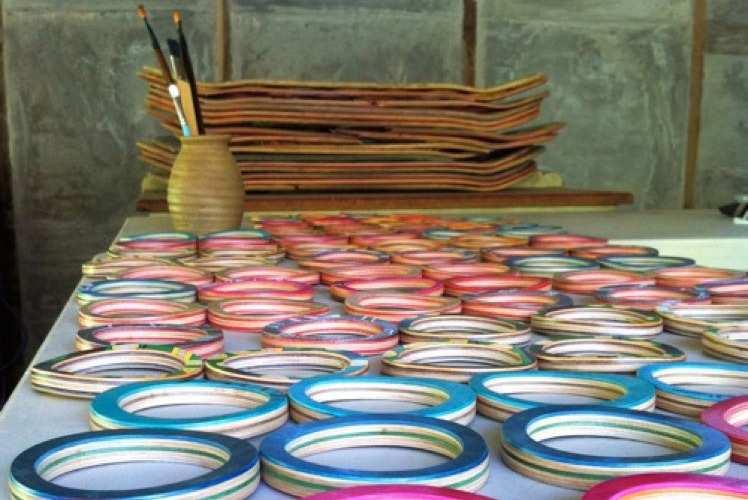 It’s funny looking back to when I first started cutting up skateboards. 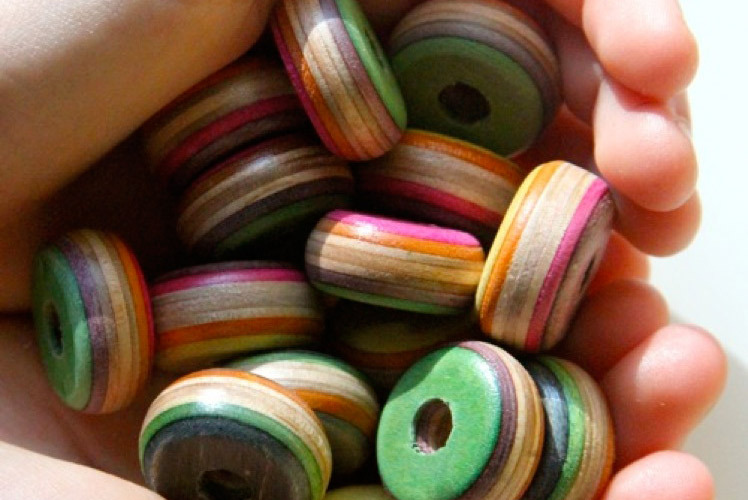 I used to use just sand paper and a file to make my first pieces. 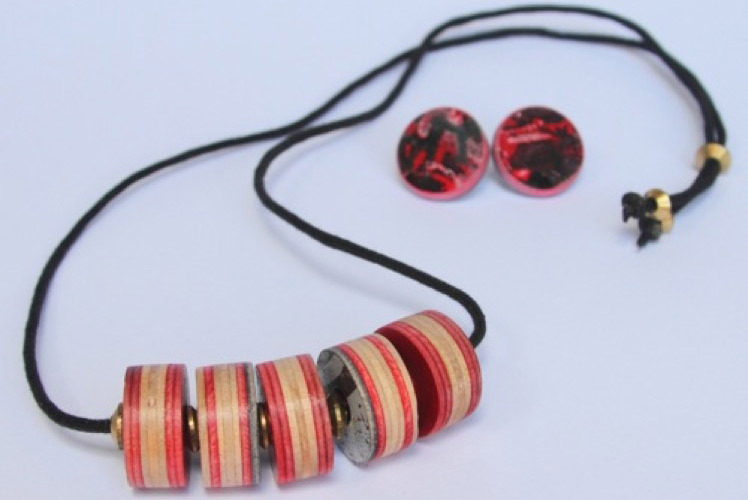 Since I started, I have changed my style to see the boards and jewellery pieces as a cohesive collection, rather than individual pieces. The colours and designs of each board I use is more thought out. I’ve developed some great production methods over the years, and this gives me freedom to use the broken skateboards in a broader way, to utilise more of the board and artworks on each board. My main inspiration comes from skateboarding & bmx, the colours, designs, fashion and the freedom to express it how you want. Colour is what inspires the most, cutting a board for the first time is like taking the wrapper off a lolly, not knowing exactly what you are going to get. I have always had a thing for colour ever since I was a kid, always had pencil to paper trying to better my techniques and styles. The boards themselves are inspiration. 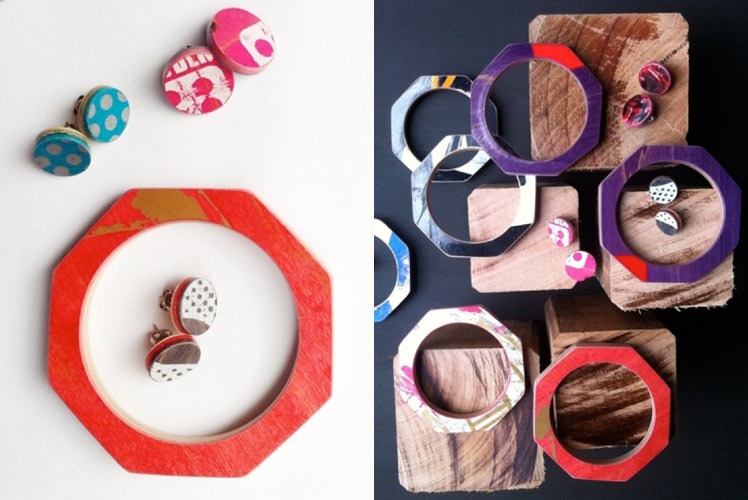 Working with the broken pieces and scraps of coloured ply spark new ideas and shapes and products. Our creative workspace is in a constant state of change, as we are building our family home. My workshop moves around to un-finished sections of the building site. One day soon we will have a dedicated workshop space, which will allow us to expand our product range to where we want. The best parts of my work space is that I get the chance to be surrounded by nature all day long, looking onto the rainforest and all the life and beauty that comes with it. Sometimes I just stop, look and listen. What challenges have you faced starting your own label, and what are some of the things you love about it? The biggest challenge has definitely been trying to build a home, and establish and focus on Deadwood. Not having a permanent studio/workspace has impacted a lot. The environment also plays a massive part, it’s either really wet or like today really cold!!! Moisture is a big problem, it affects the materials and finishing processes. Also, there’s never enough hours for trialling all the new products we want to make. Things I love about starting and running our own label are being able to work alongside my wife, and live and work where we do. To be able to work with something that has been a passion of mine for my whole life is motivating. And, I can knock off and go for a skate or bike ride with my kids when I want! I want to take Deadwood Creative to the next level while keeping to our core values; all hand made; all recycled products; don’t sacrifice quality over quantity. 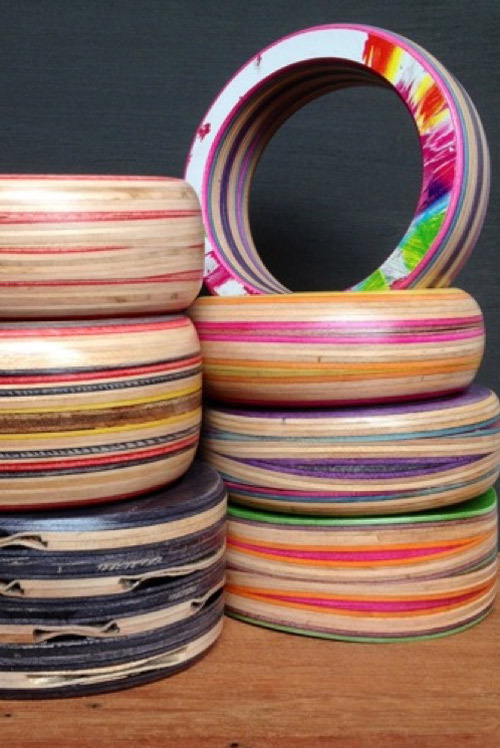 I want to be able to showcase the amazing things that can be achieved with old broken skateboard decks. And share the skateboarding love with a broader audience. There are some big things happening in the next little while, new products, designs and processes. Stay tuned. Great work, it’s wonderful to come across product in a vast sea of laser cutting that is hand worked. I only hope your customers are aware of the difference. How refreshing!